Everyone brings certain things into a relationship. You bring your lessons, your experiences, and your expectations. You bring emotional issues from your past, but also an excitement and hope for the future. You bring your vulnerability and your best self. But having diabetes means that you bring that too. I’m sure everyone is different when it comes to when they bring up the fact they have diabetes. For me, if the guy doesn’t already know, the topic comes up pretty quickly. “What do you do?” is followed by a description of my current job followed by “and I write a blog.” That statement is naturally followed by “what do you blog about?” Whether I like it or not, diabetes is a big part of my life and requires a lot of attention. It’s important that whoever I am dating understands what it means to have and manage diabetes, and the sooner they know that, the better. So I decided to put together a short list, 6 tips for dating this diabetic. As all diabetics deal with their diabetes differently, I cannot generalize this list to all type 1 diabetics. Maybe these tips apply to you, but maybe they don’t. But if you do ever find yourself dating a T1D, it might help to keep these in mind. 1. Don’t assume I can’t eat something with sugar in it. I appreciate the concern, but let me tell you what I can and cannot eat. If you’re not sure, you can ask me. However, I prefer “Can you eat that?” to “You can’t eat that, right?” And if I say no to that dessert or piece of pizza, it doesn’t always have to do with my diabetes. There are other reasons I turn down food, you know, because I don’t like it or I’m trying to watch my girlish figure. 2. I know part of dating is finding common ground, but if I tell you I have diabetes, please don’t regale me with tales of your grandma or her friend who also had diabetes and then had to have her foot amputated. Or that went blind, or who died. Seriously. 3. I can joke about my diabetes (a privilege of living with it). When we get to know each other better, maybe you can joke about it too. But until then, diabetes isn’t a joke. And I’m not going to find your jokes funny. I promise you won’t have diabetes when you finish that ice cream sundae. 4. When I say I don’t feel well, it’s (usually) not an attempt to get out of a date. Low and high blood sugars can leave me feeling pretty icky, but the feelings usually pass. Is there anything you can do? Probably not. But understand that maybe we need to sit for a little longer until I feel better and can drive or that we need to stop while I test and treat my blood sugar. Maybe we end up being late. You have to be okay with that. But also remember that sometimes when I don’t feel well it has nothing to do with my diabetes. 5. I think that when dating someone with diabetes, it’s important to plan ahead, but also be flexible. Depending on my blood sugar, sometimes I have to shift things around such as eating earlier or later than planned. We may have to switch from our plan for pizza if my blood sugar is too high. If you know we’re going to be out for a long time, give me a heads up so that I can make sure I have enough insulin/supplies/snacks/etc. I’m all for spontaneity, but I just need to make sure that I’m prepared. 6. Don’t be a prick. I get enough of those each day. I thought it would be interesting to provide some tips from the perspective of someone dating a person with diabetes. Rather than ask my exes, I found a good list on the American Diabetes Association’s website that I wanted to include here. 1. Learn as much as you can. The more you know, the better you can understand the physical and emotional experiences of your partner. It helps to share that common bond and provides comfort to your partner in discussing his/her feelings if they are going through extreme shifts in their blood sugar levels for example. 2. Offer to become involved. Gauging how involved you should become in your partner’s blood glucose and meal planning can be difficult. Some partners might not want that much involvement, and others do. However, offering that support shows you care and can provide your partner an emotional lift. Sometimes I inquire about what my girlfriend’s glucose reading is after a test. If it is low, then I will offer to help her find something to eat or drink. If it is too high, then I know not to suggest having a meal right away. 3. Be flexible surrounding meals. I generally eat on a structured schedule – breakfast before going to work, lunch around 11:30 and dinner when I get home from work. However, one with diabetes might not always be able to eat on such a structured schedule; it may depend on his/her blood glucose level at the particular time. In my relationship I have learned to be more flexible in my meal/snack schedule, but we have also communicated that to each other that if one person is hungry and the other isn’t (or can’t eat at that particular time), then it is acceptable to go our separate ways. 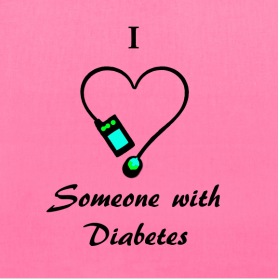 Do you have any tips to share either as a person with diabetes or someone who has dated one? I’d love to hear them. Well, I must say it is a very nice and useful post with several useful tips about dating a diabetic. It is an appreciable work for sure and it will help diabetic people to get their love for sure. Singles having improper information about diabetic people and maintaining distance with them, will be availed with right information through your post and it is really helpful for all those people. I just started dating this guy who has type one and has a pump. We have been on like 2 dates both were group dates. I’m afraid to ask too many questions about it because I don’t want to look like a crazy person and personally would feel violated if I had it and someone asked me lots of crazy questions like can you go swimming? Do you have to sleep with that? my boyfriend also has a pump. It can be detached while the needle stays in for swimming, My boyfriend sleeps with his.. I am dating a man who is type 1 diabetic. It is easy to get fruatrated sometimes with his blood sugar levels, or if one minute he is feeling fine and the next he is not. I always try to remember that I cannot know exactly what he is going through, but that I can trust him to know what he is feeling and what he needs. I can show support and help if needed, but I am not in any place to tell him how he is or should be feeling.